Prime Minister announces plans to keep Defense Ministry portfolio following departure of Avigdor Liberman, despite Jewish Home ultimatum. Prime Minister Binyamin Netanyahu announced plans Sunday night to retain the Defense Ministry portfolio following the departure of outgoing Defense Minister Avigdor Liberman (Yisrael Beytenu), despite an ultimatum by the Jewish Home party. Deputy Defense Minister Eli Ben-Dahan (Jewish Home) will remain in his position, following a spat earlier on Sunday over the future of Ben-Dahan’s reappointment. In a special address Sunday evening, Netanyahu said he will serve as Defense Minister for the first time in his career. "I will now be taking the position of Defense Minister for the first time ever." During his address, Netanyahu defended the decision to accept a ceasefire with Hamas last week, following the worst outbreak of fighting with Hamas since 2014. The Prime Minister said that the decision was made based on classified material he was unable to reveal, but said he had a clear plan of action going forward. "I know that this comes at a time when there is a great deal of criticism against Israel's defense policies. I want to tell you, citizens of Israel, I understand what you feel. Much of the criticism comes from the fact that the reasons [for our decisions] are based on material - seen by the IDF chief of staff, IDF generals, the Shin Bet chief the Mossad director, and myself - that simply cannot be revealed at this point." "I have a clear plan. I know what to do, and when to do it. And I'll do it. "When I took over as Finance Minister [in 2003], I had a plan of what to do and when to do it. I took over at a very difficult time for the Israeli economy, but we made a lot of progress, for which I paid a big political price." 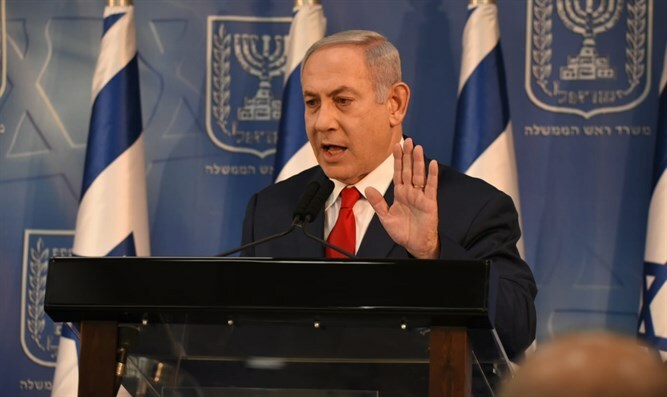 Netanyahu urged coalition partners to remain in the government and prevent snap elections, recalling the toppling of the Likud-led Shamir government in 1992, which resulted in the formation of a Labor government following that year’s election. "I will do everything possible to prevent unnecessary early elections. I spoke with coalition leaders and told them this is the time to show responsibility. Don't take down this government. I reminded them of what happened in 1992 [to the Shamir government] when the Likud government was toppled, and we ended up with the Oslo [Agreement]." Last week, Defense Minister Liberman announced his resignation from the government, citing among other things, the cabinet’s decision to accept an Egyptian-brokered ceasefire with the Hamas terror organization. Some 500 rockets and mortar shells were launched from the Hamas-ruled coastal enclave towards Israel during two days of attacks, following an incident in the southern Gaza Strip between an elite IDF special forces unit and a cell of Hamas terrorists. One person was killed and nearly 60 more injured in the rocket attacks. Both Education Minister Naftali Bennett (Jewish Home) and Defense Minister Liberman protested the decision to accept the ceasefire. Following Liberman’s resignation, the Jewish Home faction demanded Bennett be appointed to serve as Liberman’s successor at the Defense Ministry, warning the party would bolt the coalition if their demand was rejected.